Photo from the back of his Breyer Premier club release box, Morgen sculpting a new action stock horse. Initially released as an exclusive limited edition in 2014 this guy is now available in stores and online. 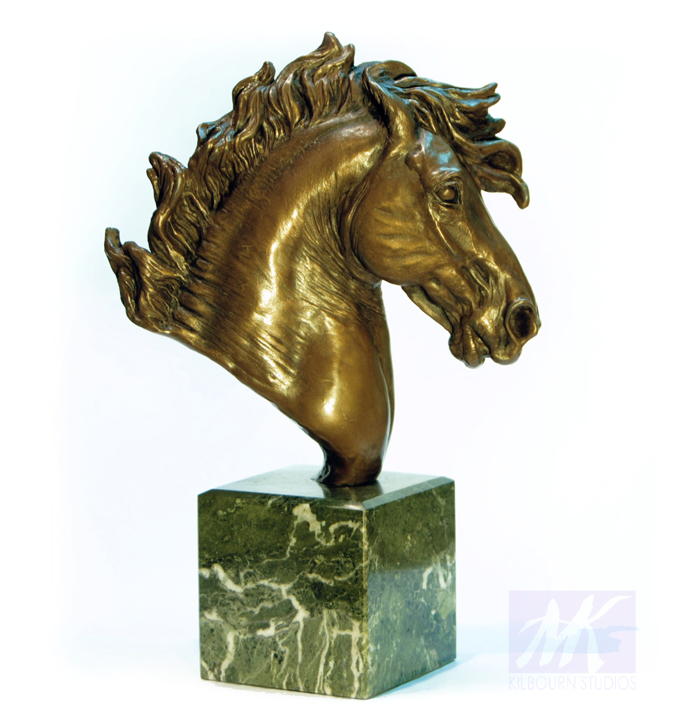 Morgen Kilbourn is a focused sculptor known for representing the vivacious character of animals, especially horses, in exquisite and precise detail. She has brought her award winning works to private and commercial patrons around the world for over a decade. With each piece Morgen is inspired to bring vitality into her realism with both a thorough understanding of anatomy and a dose of charisma that delights and inspires her clientele. Be it horses or any animal, I strive for capturing an undeniable likeness and infusing that extra spark of character. I also enjoy giving even the most static poses a dynamic feel. Overall with each work my aim is to go beyond the accuracy of biomechanics to infuse vitality and vigor into the subject. Photo of Morgen sculpting their new working stock horse mare from the back of this new Breyer Premier club release box as well. Initially this model was released as an exclusive limited edition in 2015 but it will be available for purchase soon. Morgen creates limited editions of exceptionally detailed bronzes, fine bone china and artist resins. 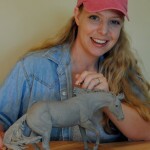 Recently she has begun working in fired clays as well to create larger one of a kind sculptures and has been making life sized animals with the same level of detail that has always drawn her collectors. In addition to private commissions and licensing, she has also taken on a few commercial commissions. Twice by Breyer Model Horses for their Premier collection, both works which ultimately are included in their regular product line. 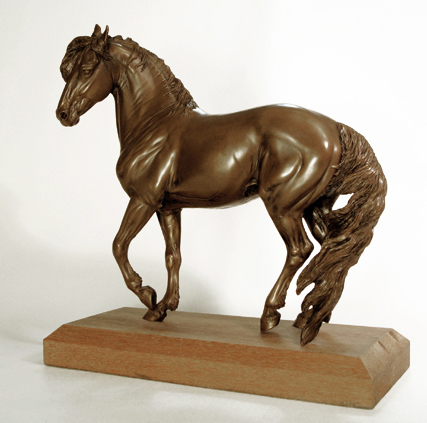 Also for a new company, Copperfox Model Horses, she designed for one of their initial new products to be sold primarily in the United Kingdom. Some of Morgen’s newest projects have gravitated toward larger scales, including some life size canine studies. Her childhood in Connecticut was immersed in art, art educators and this nurtured her artistic skillset from an early age. Her maternal grandfather was a renowned lead repoussé sculptor that welcomed her to experiment with a wide variety of media, from stained glass to linoleum printing in his teaching studio. Morgen’s father was also a commercial sculptor by trade who also taught art and helped her derive a passion for creativity with unlimited encouragement. Much of her inspiration comes from the subject she loves most – horses. She has structured her life around them and trying to learn every aspect of their anatomy, behavior, and character. She extends this love to each work and strives to capture the beauty, motion, and spirit of these great animals. From the earliest possible age she found ways to work off riding lessons and then by working after school and saving up was able to buy and care for her first horse at age 15. Seeking out any way to be around them, she retrained horses for their owners and even gave trail rides one summer. This determination allowed her to have a wide range of experiences from going on call as an assistant with Equine Veterinarians or as a working student and groom several times for eventing and internationally competitive dressage riders. More recently she operated a small boarding stable for a few years to help provide for her own thoroughbred that she’d bred, raised and trained. Morgen’s education and career path was initially biology, focusing on veterinary science and then later biotechnology, prior to sculpting full time. She took a handful of formal art classes in college, but during this time freelanced magazine illustration and graphic design. Among her published accomplishments, her corporate graphic design work was selected by the editorial team for a cover of an issue of Science magazine. As a sculptor relatively new to juried shows she has been accepted into highly competitive shows in galleries and museums around the country. She has also won many honors such as the Leonard J Musilman Realistic Sculpture Award and currently has had work selected for the prestigious 55th Annual Art and the Animal Tour with the Society of Animal Artists. 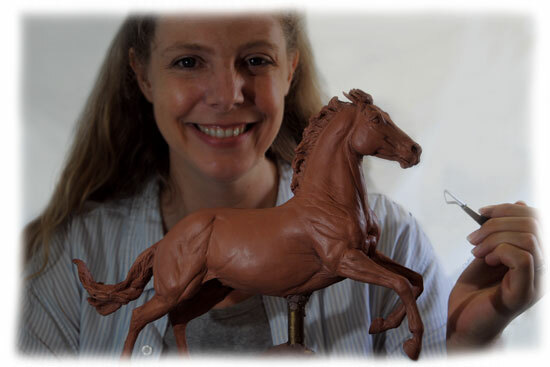 She is a member of several art organizations including as an Associate member of the Society of Animal Artists (SAA) and a Signature Member of the American Academy of Equine Art (AAEA) where she is currently serving on the Board of Directors as the AAEA Dean of Sculpture. 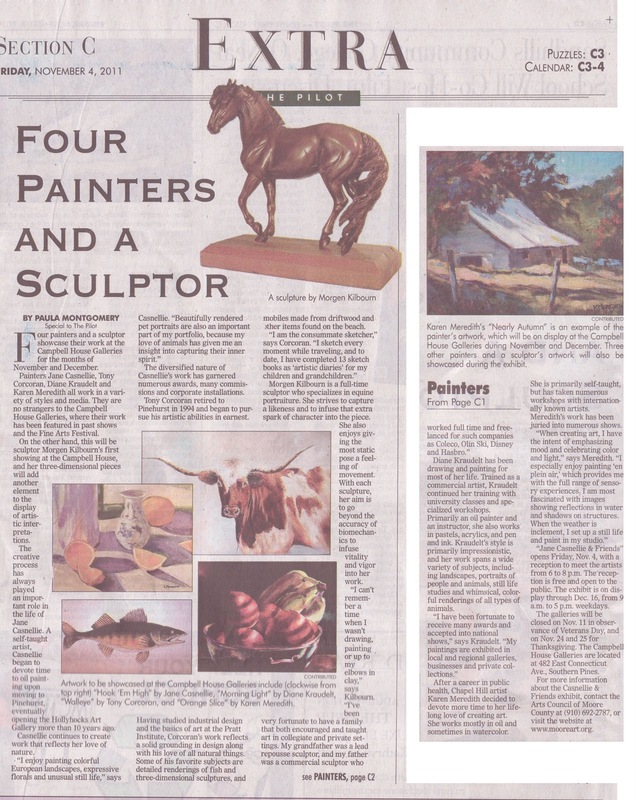 The artist resides in North Carolina and sculpts full time. 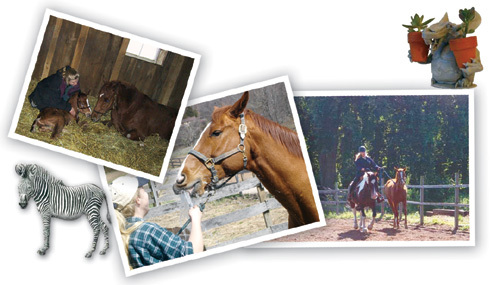 Several times a year Morgen teaches classes including workshops thru the AAEA at the Kentucky Horse Park and also is available for private commissions or individual instruction on a limited basis in central North Carolina.